During the democracy protests in Hong Kong, locals who turned on their TVs on Sept. 29 to watch Voice of America (VOA) may have been greeted with a blue graphic on the screen and a radio broadcast. VOA is the official news broadcast service of the United States government. It is overseen by the taxpayer-funded Broadcasting Board of Governors (BBG), along with Radio Free Asia (RFA) and three other news services. News of the change was published on Oct. 6 by BBG Watch, an independent BBG watchdog group of former employees at U.S. international broadcasting services. BBG Watch claimed that senior managers at BBG and VOA “stealthily cut 14 repeat hours of satellite TV news programming weekly to China in the middle of the Hong Kong-China crisis,” and moved some VOA Chinese TV broadcasts to “less desirable time slots” without alerting VOA’s China Branch staff. “On Monday, September 29, the loyal viewers of Voice of America (VOA) ‘Weishi,’ the VOA Mandarin TV program, were surprised to see their TV screen turned into a blue graphic during some hours when the original program previously aired was repeated,” an unnamed journalist told BBG Watch. Rather than having a VOA TV broadcast, viewers received a RFA radio signal. The timing of the switch was very sensitive for a news service that serves the Chinese-language populations in Hong Kong and mainland China. Students in Hong Kong started sit-ins on Sept. 22, mostly on their own campuses. On Sept. 27 the protests took off, with tens of thousands of people jamming the area around the Hong Kong government buildings and other protests spots. 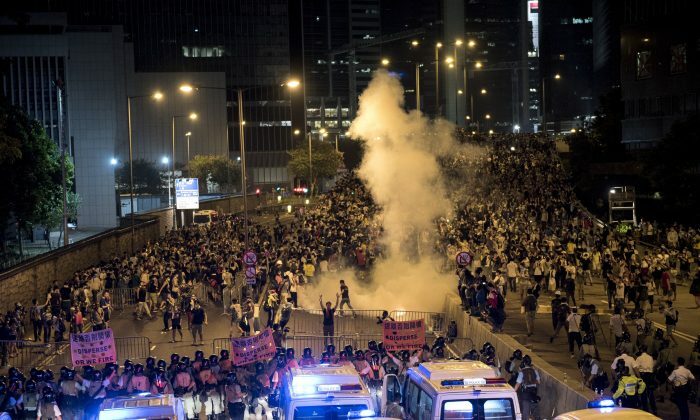 On Sept. 28, the Hong Kong government dispersed the crowds with barrages of tear gas and pepper spray. BBG Director of Global Operations André Mendes said in an email that VOA produces two hours of Mandarin programming each day, which used to be repeated five times a day. The main shift in programming was meant to replace one of the five broadcasts with one from RFA, which adds more original content for viewers. “As you can imagine, we believe that with everything that is going on in China and considering the content replaced, having RFA’s radio on TV in the 4 vernaculars is a powerful addition to this channel’s lineup and likely more impactful than the more entertainment-driven content that was replaced,” Mendes said. “Regarding the RFA video stream itself, RFA has just introduced a live stream from Hong Kong showing both a downtown scene of the protest and another shot of a police force deployed to control the population,” he said. Ted Lipien, former acting associate director of the Voice of America and director of the NGO Committee for U.S. International Broadcasting (CUSIB), said the change was poorly timed and managed. “The management made these decisions even before the Hong Kong crisis started and did not attempt to reevaluate the situation, as far as I can tell,” Lipien said in an email. Lipien said that ideally, VOA Mandarin TV would have replaced its repeat broadcasts “with more original, live programming and have live news updates in every repeat” when the Hong Kong crisis started. VOA staff said the decision was out of their hands. “It wasn’t the China branch’s decision. It was made by the management above,” said a supervisor at VOA’s Mandarin service in a phone interview. He then referred the call to William Baum, director of VOA’s East Asia & Pacific division, who did not immediately respond to a voice message. Voice of America and Radio Free Asia are ending their shortwave English radio broadcasts into China.